Aluminum The Importance of Soil pH What is pH and what does it mean? How is pH measured? Availability of Nutrients Micro-organisms How can pH be changed? The five elements that form the foundation of most soils are: calcium (Ca), magnesium (Mg), potassium (K),sodium (Na), and aluminum (Al). 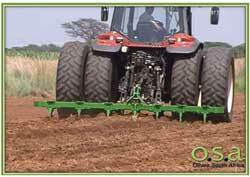 Calcium helps to attain better soil structure and drainage. Calcium reduces toxicity of certain heavy metals e.g. aluminium and manganese in acid soils. Calcium improves the soil environment for micro-organisms e.g. it encourages the growth of nitrogen fixing bacteria. Calcium helps to make phosphorus and some micro elements more available. However, too much calcium can be detrimental for olive production. An oversupply of calcium can inhibit the uptake of potassium, magnesium and trace elements like manganese, zinc and iron. 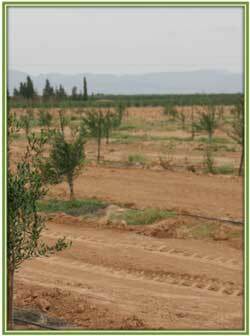 Phosphorus can be locked up by high calcium supply, making the phosphorus unavailable to olive roots. Calcium is stored in the roots and stem of olive trees. The olive tree draws heavily on these calcium reserves in the major cell division stages (growth). These cell division stages occur during vegetative growth and after flowering when the fruit develops. If for a significant time, the withdrawal of calcium is higher than the depositing, the reserves are depleted and the tree will tend to have lower productivity. An olive tree will be impaired in its growth and health when it doesn’t have enough calcium. A low potassium level can increase biennial (alternate) bearing of olives. Potassium is involved in the control of the opening and closing of the stomata in the leaves which makes it very important in the drier climates. At the extreme, overly high potassium levels in the soil can result in deficiencies of calcium, magnesium, boron and zinc. Magnesium is part of the chlorophyll molecule so it is important for healthy foliage. Olive trees lose their leaves prematurely when the supply of magnesium is too low, which naturally has a negative impact on the production. Sodium plays a role in water and pH balance. However the most important aspect of sodium is where we see it in excess supply…salinity. Olives are quite tolerant to saline conditions. Soils can have a high pH if they have high sodium levels. 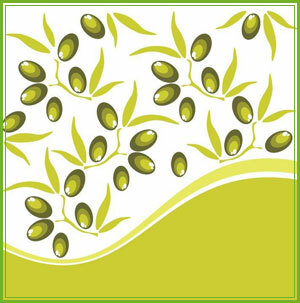 Calcium has beneficial effects to olives under such high pH conditions. Boron helps plant to absorb and use calcium. It works in association with plant auxins for the growth of meristematic tissues (all the growing sections of leaves, roots and stems). Boron also assists in cell wall development, pollination, fruit development and the translocation of sugars. 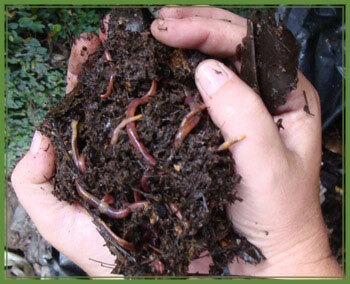 Soils low in organic matter. Soils with high pH (soils that have been too heavily limed). Soils that have had a large amount of nitrogen fertiliser. Small leaves, leaf chlorosis and eventual tip necrosis (death of tissue), excessive branching. Rosette growth of auxiliary buds, limb die back. Cracking, corky blistered stems that may become hollow or brittle. Poor yield of monkey face fruit (distorted shape) and thickening and twisting of roots which fail to spread properly. Aluminum can be a toxic element for olives. It is toxic when the pH levels are too low. Some areas in South Africa have acidic soils with high available aluminum levels. Calcium and organic matter play an important role in bringing the aluminum toxicity under control. The pH of soil, or more precisely the pH of the soil solution, is very important because the soil solution contains nutrients that plants need in specific amounts to grow, thrive, and fight off diseases. If the soil solution is too acidic plants cannot utilize Nitrogen (N), Potassium (K), and Phosphorus (P) and the other nutrients they need. Plants are also more likely to take up toxic metals and some plants eventually die of toxicity (poisoning). 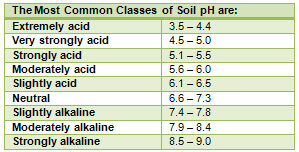 pH is a measure of the acidity or alkalinity in the soil. More correctly it is the measure of the potential of Hydrogen ions. The higher the concentration of hydrogen ions in the soil, the lower the pH. The full pH scale extends from 1 to 14 with 7 being neutral. Lower values than pH 7 represent increasing acidity; higher values represent increasing alkalinity. In practical terms, soils between pH 6.5 and 7.5 are considered neutral; soils in the range 5.6 to 6.0 moderately acid; and below 5.5 strongly acid. The scale is logarithmic, so pH 4 is ten times as acidic as pH 5 and pH 2 is ten times as acidic as pH 3, and so on. Soil pH can be measured in water (pHW) or calcium chloride (pHCA). take note of the method used. What is the significance of pH? soil. Soil pH thus affects the availability of several plant nutrients. Plant nutrient availability varies quite dramatically with the soil pH. A pH range of 6 to 7 is the most favourable for plant growth because in this range most plant nutrients are readily available. Soils that have a pH below 5.5 generally have a low availability of calcium, magnesium, phosphorus, nitrogen, sulphur and molybdenum. At these low pH’s, the solubility of aluminium, iron and boron is high; and low for molybdenum. At pH 7.8 or more, calcium and magnesium are abundant. Molybdenum is also available if it is present in the soil minerals. High pH soils may have an inadequate availability of iron, manganese, copper, zinc, and especially of phosphorus and boron. 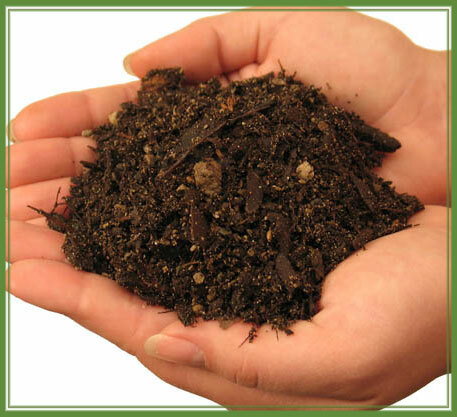 Soil pH affects many micro-organisms. A pH of 6 to 7 is favourable for microbial activities that contribute to the availability of nitrogen, sulphur and phosphorus in soils. Knowing whether soil pH is acidic or basic is also important in relation to the application of any pesticides, herbicides, and/or fungicides. If the soil is too acidic the pesticides etc, may become ineffective, changed to an undesirable form, or may not degrade as expected, which can result in problems for the next crop period. These products will not be absorbed (but held in the soil) and so end up in water runoff and eventually become pollutants in our streams, rivers, lakes and ground water. How can pH be changed? 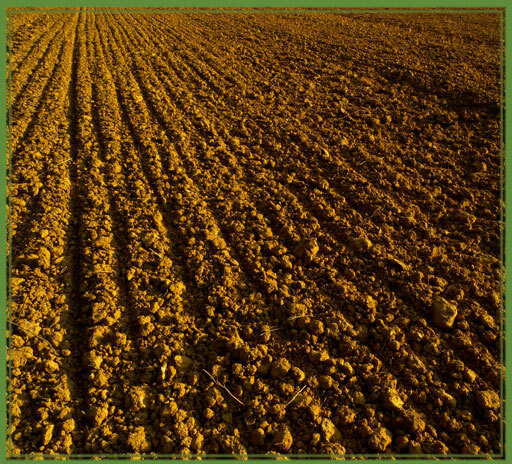 Finely ground limestone (calcium carbonate) or dolomite (calcium and magnesium) are the most common materials used for liming soils and are the most economical way of reducing soil acidity. The amount to use would depend on the buffering capacity of the soil (indicated by texture) and the change desired. On acid soils phosphorus is retained in less available forms than on slightly acid and neutral soils (pH 6.1 to 7.5). One of the other benefits of liming acid soils is the increased utilisation of the residual fertiliser phosphorus by crops.